A wonderful experience of a lifetime adventure. Yala Peak Trek & Climbing around beautiful and scenic Langtang Valley, a wonderful and mesmerizing adventure of less than two weeks duration, an ideal peak Yala of above 5,732 m and 18,806 ft high offers a super panorama of mountains with views of Tibetan peaks. Yala Peak Trek & Climbing an ideal mountain where all types of people can join in on this exciting adventure to summit of Yala peak, as the climb is less technical graded as PD, which means ‘per difficult’ taken from French and Swiss Alpine Climbing classification, the grade with some walks on glacier and ice all the way to its summit top. 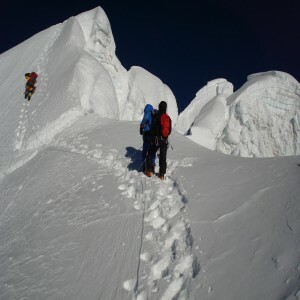 all climb will be aided in support of our expert guides who have climbed this peak several times which help you with some technical advice and knowledge before the climb with some practice and acclimatization days. 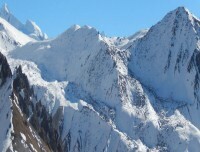 a perfect peak for beginners and as well for hardy climbers as a practice before aiming for bigger hard and tough climb, as this peak provides you with least technical difficulties; however one must be in good physical shape to enjoy this moderate adventure of short duration. Yala Peak Trek & Climbing located within east of beautiful Langtang valley, where for few days providing climbers with camping facilities, rest of the trek with overnights in nice and cozy lodges. truly a wonderful adventure around Langtang Valley and Yala Peak Trek / Climb, where you will be within enchanting alpine woodlands covered with rich vegetation and rhododendron, pines, magnolia, spruce, hemlocks, juniper, and fir tree lines, which is also the home of rare and endangered Red Panda and other wildlife with plenty of exotic bird life. besides mountain views on daily walks, the culture and traditional way of life of the local Tamang tribe is equally fascinating, visiting its heritage farm villages of the immense colorful culture of Buddhist religion of Tibetan origin, where the border to Tibet / China is within a mere distance. starting our wonderful journey with an exciting overland on high hills to reach at Langtang area within Rasuwa district of Central Himalaya and the closest Himalayan destination from Kathmandu of 32 k.m. distance as the crow fly. Yala peak Trek & climbing is one of the shortest and best trekking climb in Langtang region of Nepal. 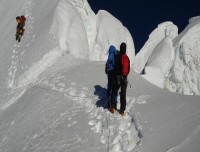 Yala Peak climbing located within east of beautiful Langtang region. 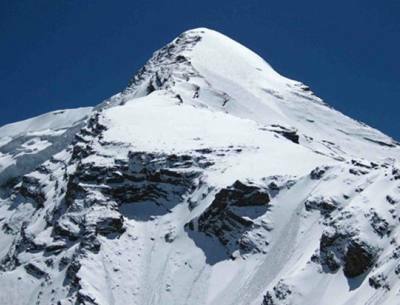 Yala peak of above 5,732 m and 18,806 ft high offers the super panorama of mountains with views of Tibetan peaks. Heading up following the raging glacial upper Trisuli River entering into a gorge filled with thick alpine woodland and then the terrain opens into a wonderful scenic valley at Kyanjin Gompa the highest point of the adventure at 3,870 m high, located at beautiful and scenic Langtang valley. from here our true adventure begins heading further east of the valley for the classic and exciting climb of Yala Peak with full guidance support of our team of staff and guides making your adventure holiday an enjoyable and memorable. after a glorious time with the tough climb and feeling high, overlooking views of mountains, and then our journey completes walking back on the same trail downhill to reach at Syabrubesi for the interesting drive to Kathmandu after an overwhelming time on Yala Peak Trek & Climbing around scenic and beautiful Langtang Valley. Yala Peak Trek & Climb around beautiful and scenic Langtang Valley. Adventure around beautiful Langtang valley with the classic climb of Yala Peak. Rolling green hills and snow-capped peaks. Highest altitude On top of Yala Peak at 5,732 m /18, 806 ft high. 1 Arrive in Kathmandu via respective airlines and transfer to hotel.On arrival at Kathmandu international airport you will be well received by Reasonable Treks & Tour staff and guide and then transfer you to your hotels within the hub of Kathmandu city around the most happening and exciting place around Thamel. Evening after checking into your rooms with refreshment our guides will brief regarding Yala Peak Trek & Climb with welcome dinner in a nice authentic Nepalese restaurant with culture show. 3 Drive to Syabrubesi 1,550 m (145 km) -07 hrs journeys.Starting this short and wonderful adventure to Yala Peak around Langtang valley taking an early morning overland drive to reach Syabrubesi starting point of the trek, drive leads on winding uphill and downhill road, past farm villages and towns through Trisuli Bazaar, around sub-tropical climate and then journey leads to cooler alpine temperature as the landscapes changes with the culture and as well people, reaching at Dhunche 1,965 m high, major town of Langtang area and headquarter of Rasuwa district. from here start of Langtang National Park journey continues further downhill for few hours to reach our first overnight stop in Syabrubesi village. 6 Trek to Kyanjin Gompa 3,870 m / 12,696 ft -04 hrs.From Langtang village walk leads on pleasant trail for an hour and then heading higher encountering “mani-prayer wall” where walking clockwise positive way respecting Buddhist culture and religion, walk leads further east where valley opens up with views of snow capped peaks. after few hours of gentle walk with views brings you at Kyanjin Gompa a charming and scenic spot with beautiful views of Langtang Lirung of above 7,000m and its icefall at close distance Kyanjin Gompa, surrounded by a ridge formed by glacial moraine of rocks and boulders. 7 Rest Day at Kyanjin Gompa enjoy short hike around scenic hills.Full rest day at scenic Kyanjin where you can visit its small Cheese factory and then hike up to Tsego-Ri, Kyngin Ri at 4,700 m / 15,420ft offering panorama of snow capped mountains with range of central Himalaya peaks, includes Ghengu Liru (Langtang II 6,571m / 21,560ft), Langtang Lirung (7,425m / 23,765ft) Kimshun (6,745m / 22,137ft) and Shalbachum(6,918m / 22, 699ft) to the south, the Chimsedang Lekh forms a ridge of peaks which includes Naya-Kanga 5,846m and Gangchempo, Tilman’s beautiful Fluted Peak. Beyond it extends to the Jugal Himal, terminating in Dorje Lakpa (6,980m / 22,929ft).to the east the upper meadows of the Langtang end in a massive mountain wall, forming the frontier with Tibet. 8 Trek to Yala Peak Base Camp 4,400 m / 14,435 ft - 06 hours.After Kyanjin Gompa, heading towards our main highlight and adventure towards Yala Peak base camp leading at the end of beautiful and scenic Langtang valley, walking on rocks and glacier with steep climb over icy path to reach available and reasonable flat spot to set our base camp at 4,400m. 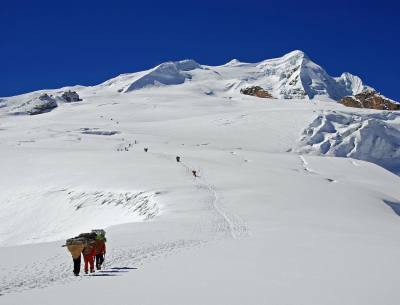 Base camp provides views of Ganchenpo, Naya Kang, Tserko Ri, Yala peak and others peaks till Yala base camp is reached for the first camp of this trip after being in the comfort of a lodge, base camp with marvelous view of high massif surrounding mountains. 9 Trek & Climb to Yala Summit 5,732 m / 18,806 ft to base camp.Our main Highlight of the adventure, starting early morning towards Yala Peak summit, the climb leads with less technical difficulties, but takes nearly eight hours to reach the top ridge the summit top and back to base camp. a strenuous tough climb leads you on the summit top at 5,732 meters / 18,806 feet high, from the top enjoy overlooking sweeping panorama of mountains and then descend safely to base camp, after an exciting and enjoyable climb on top Yala peak. 10 Reserve and contingency day in case of bad weather.World Trail Finders Adventure Trek reserves a spare day as contingency, in case of bad and unfavorable weather, which can happen occasionally around high Himalaya, if all goes well according to our itinerary using this spare day on route to Syabrubesi with short day enjoying beautiful views along the walks. 12 Trek to Lama Hotel 1,550 m - 06 hrs.After a wonderful time at Kyanjin, retrace the journey back on same route to Lama-Hotel a small settlement in the midst of the forest at the bank of upper Trisuli River. 13 Trek to Syabrubesi - 05 hrs.Our last day walk of this wonderful trip as the route leads on the same trail following the raging Upper Trisuli Rivers and then heading down hill to reach our final overnight stop at Syabrubesi. 14Drive back to Kathmandu afternoon free at leisure.After a fabulous time around Langtang Valley with Yala Peak Climb morning taking an overland journey with uphill to Dhunche town and then on downhill past farm villages and towns reaching at Kathmandu and then transfer to your hotels with evening farewell dinner. 15 International Departure for Homeward bound.As per your international flight time transfer towards Tribhuvan International Airport for the journey back home or to respective destinations after a super and amazing time in Nepal Himalaya on high hills around Langtang Valley on Yala Peak Trek & Climbing . All meals (breakfast, lunch and dinner) during the trek and climbing time . Services/items required above base camp (i.e. mountain food, tents, gears, gas, stoves etc. We climbed Yala Peak Trek & Climbing With Reasonable Treks And Tour/Anil Dhungana provided we Very helpful and professional assistance in planning for Yala Peak Trek & Climbing he’s is Organization for 15 Days Yala Peak Trek & Climbing, Mr. Anil He is Recommendation climbing Guide Dawa Sherpa and porters were very friendly and they adapted the trip to our wishes. We take a lot of photo during climbing times We did it the Wonderful and amazing experience to reach the Top at Yala Peak Trek & Climbing Guide Dawa he gives to everything information details on the way I Show village and mountain. Really enjoyed the climbing in Nepal, Thanks to our Guide Dawa Sherpa also porters, we want to highly recommend this company and staff for other travelers. Thank you so much, Mr. Anil, .we really happy for your Trip. We will back Next Time! !